Paul Shipman surveys his Empire troops, while Stephen Houston brings up his Elf support. 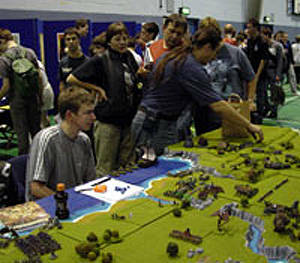 This year the Gaming Club network allowed wargaming clubs to put on demonstration games at Games Day. Being one of the clubs selected to participate, we decided to put on a large Warmaster game. We wanted to show all six armies that appear in the Warmaster rules, so we needed a scenario to justify why all these armies would be in battle together. In a relatively quiet coastal region of the southern empire an Orc warboss establishes an encampment. This effectively make passage through the area very treacherous. What makes things worse is that to the north is the Steel Mountains with the only passable point for 100 miles being here. News reaches the Empire that a representative of a Chaos Warlord has negotiated an agreement with the Orcs to allow them to pass through their strongpoint and into the Southern Empire. Seeing the threat the Southern Empire along with King Albert’s Support plan a naval offensive on the Encampment with 2:1 odds. The High Elves notify the Dwarves, who would be caught up in the conflict being so close to their realm, and their massed forces converge on the site to bolster the Empire Forces, and put an end to the Evil scourge once and for all…. His thoughts returned to the day ahead, he would be in the first wave, his allies’ troops would arrive soon after, and once the beach was secure. "Brave men, courageous men, men with wives and children. Sigmar forgive me for my actions." With that he took a last look at the horizon and walked to his cabin to prepare for the ordeal to come. As the sunlight slowly warmed the land the empire detachments formed up on the beaches, their weeks of drilling had paid off, allowing them to get onto the shore without any orc resistance. On the hill above them they could barely see their objective, the orc village, in the gloom. As their eyes adjusted to the light they could make out masses of shapes behind rough barricades and for a moment there was complete silence, except for a whistling sound that seemed to be getting closer... With an earth-shaking boom the house size rock landed on the leading crossbow men, the rest of their detachment freezing in shock confused by the sudden attack. Then the horde seemed to animate, with the chanting of shamans booming over the disorganised horde. The chanting grew in intensity and suddenly unseen hands pushed the second detachment back towards the beach. With a loud trumpet call the Karak Ominar’s Elven force had arrived, however their orders were lost in the noise of battle and their progress was hampered. Meanwhile on the beach the empire troops roused themselves and advanced towards the orc mass. The mechanical division, made up of steam tanks and cannons, bombarded the orc positions killing many goblins and raising a cheer from the beleaguered troops. The orcs responded quickly, sending a mass of cavalry mounted on snarling wolves and grunting boars towards the appearing elf threat, along with these lumbered two bored looking giants. The rock lobbers continued their bombardment of the main empire attack, killing most of the crossbow men in the process. Further evil reinforcements arrived in the form of Omadon the Red’s chaos horde coming in from the Northeast, advancing in a menacing fashion towards the beach. The leading unit of chaos knights, hungry for blood, advanced all the way to the beach and charged the isolated cannon unit. The crewmen were so shocked by the sudden attack they didn’t have time to fire grapeshot at their attackers before they were cut down. The evil harpies descended on the other cannon unit, ripping the crew to shreds with their sharp talons. They continued their viscous attack into the pistolliers, but were beaten back by the fighting skill of the young noblemen. A loud drumbeat sounded across the battlefield, signalling the entrance of the Ironfists Dwarves from the Northwest, their arrival was punctuated by the mad gibbering of the orange hared slayers leading the dwarf advance. The elves managed to muster their forces and rose to face the charge of the orc brigade. The Empire force continued their reluctant advance towards the barricades, their steam tanks leading the way pounding the orc scum with the finest Nuln cannonballs, alongside them were the valiant flagellants. The pistolliers charged the harpies but were forced back by the sharp claws and evil temperaments of the demon beasts. With deathly quiet the undead horde slowly shuffled onto the battlefield, causing many to stare in wonderment. The orcs exploited this momentary lull in the fighting, from the greenskin horde rose a cry, and they tumbled forward en masse, crashing into the stout empire infantry like a volcanic tide. The chaos knights, who smashed into the second detachment of crossbow men and halberdiers, matched this mass advance. The harpies also attacked the pistolliers once more, summoning more of their kind to attack the noble foe. The core fight turned into a battle of attrition, with numerous units charging into the fray, when the dust settled, the bodies were piled high on both sides and in the centre a single small group of crossbow men were shouting their defiance to the skies. The other detachment was not so lucky; the combined strength of the chaos knight units pushed them back over the cliff and to their deaths on the rocks below. There was a rousing cheer as the steam tank, bedecked in red and yellow, clanked off the small transport boat, signalling the arrival of the empire reinforcements. It was supported by a mass of halberdiers, determined to hold the beach at all costs. The remaining knights, resplendent in their silver amour charged squarely at their evil opposites. Their conflict, resembling the battle itself, was drawn and both units withdrew to regroup. The elves and dwarves marched towards the horde, trying to help the empire beachhead before it was too late. The Evil then made their move, and the battle was joined. The undead shuffled forward, a giant Sphinx looking menacing as it towered above the skeletal masses. The chaos executed a pincer movement, charging across the bridge as well as sweeping along the beach to the vulnerable empire rear. This offensive caught the remaining Carlsberg knights unawares, and they were destroyed in a hail of blows from the black armoured attackers. The giants pulled the mighty elf dragon apart; it’s wings flapping uselessly under the blows from its opponents tree sized clubs. The orc bombardment continued and, along with greenskin bowfire, managed to destroy the two Carlsberg steam tanks. It became apparent that the Carlsberg force was virtually wiped out under the sustained attack. "Today we face the last battle against the dark, for ourselves, for our families and for the emperor. Charge!" and with that he dug his spurs into the flanks of his horse and charged at the black armoured knights, the last words on his lips: "for you Rebecca...."
The battles cry "For King Al!" rang across the battlefield as the remaining empire arrived and set about making them selves known, charging into any chaos scum within range. The elves concentrated their attacks on the deadly giants in their midst, cutting them down in a hail of bow-fire and magic. The dwarfs continued their slow advance towards the village, their movement slowed by the unfamiliar terrain. The fighting in the centre was successful for the empire, who managed to reclaim their beachhead, but with great losses. It was only a matter of time until they fell. The chanting of the orc shamans once again boomed above the din, with a brave unit of pistolliers being pushed into deep water, where they drowned under the weight of their amour. The remaining halberdiers we caught by the grotesque trolls and wiped out. The knights were more fortunate, pushing back their foe and buying some time to counter attack. The remaining chaos troops surrounded the beachhead. As I leapt on the last boat leaving the cove I saw the elves and dwarves begin to withdraw. I saw the remaining empire fall one by one, until a single figure guarding a blue and white banner was all that remained. I looked across at the disappearing beach, the chaos horde cheering as they swarmed into our landing ground. Suddenly dark clouds rolled across the sky as the undead surged forward as one, driving the chaos back towards the sea. The red armoured devils fought bravely, but the mass forced them back onto the sand and into the stormy water, the last warrior screamed defiance as his weighty armour dragged him below the surface of the raging waves. There was a great crash of thunder and the sea turned a deep blood red. I couldn’t believe what happened next, the corpses littering the battle field rose from the ground like puppets on invisible strings, they stumbled into ranks, their complete silence chilling me to the bone. The sea began to bubble and an unholy wind filled our sails, speeding us away from the scene. It will be a long time in Mordheim before I return there. In total we had 7 complete armies each being 2000 points, making 14,000 points on the table! The Table was 9’ x 4’6" (just short of the 10’x 5’ allowable). We used a modular terrain system by Purbeck Terrain Systems. This incorporated a coastal section with beach and cliff edge, a river at the bottom of a crevasse - which cut the table in half with the only way across being a land bridge, a river outflow to the sea, and lots of hills, trees and rocky outcroppings. The Orc village was sited in the middle long edge of the table opposite the beach (North), next to the land bridge. The Orcs were setup first in a defensive position around the village. Next the first wave of Empire were setup on the beach to the South. It was then randomly decided which end of the table the good and evil armies would approach. It turned out that Good would approach from the West and the Evil from the East. Then each end was randomised to decide which corner each army would approach from, and what order. Turn 3 Evil: Undead arrive to the South East. Any Cavalry Unit (or Infantry in the case of Dwarves) that is brigaded with an artillery unit, can be given an order to "hitch" the artillery (this must be the last order given to the brigade). The artillery unit is then placed directly behind the cavalry but facing backwards to show that is being towed. The hitched pair can then move, next turn, at 20cm. The artillery cannot shoot while hitched and if the Cavalry are pushed back in combat (not by missile fire) then the artillery is destroyed. An artillery unit can be unhitched by again issuing an order after which it can be pointed in any direction and can fire as normal. Only one artillery unit per Cavalry unit, and no more than two hitched pairs can be brigaded (as they are each two units). War Machines cannot be towed. We felt that the Ship Rules in Warmaster were unsuitable for this scenario, so we came up with this alternative. The empire had 3 ships at it disposal; each could hold a maximum of 700 points of units. Each ship also had 4 rowboats to land the units on the beach. Each ship had to have a Character on board to order the boats to shore. Each rowboat could hold one of the following combinations. Characters and Character mounts are free. A boat can stop 10cm from the beach allowing infantry, cavalry and monsters to disembark into the sea, they will then be at half pace until they reach the beach. All other units have to disembark onto the beach or else they are destroyed. A boat can move up to 20cm per order. Once an order fails, that character (as normal) may make no more orders. Once units have disembarked their movement phase is over. Unloaded boats have a 20cm home back move towards the ship, at the beginning of its movement phase. Once back it can be loaded and moved again. Only one ship can be present at a time (we only had one). The rowboats have 6 Hits with a 5+ save, and are counted as defended. Hits are not removed at the end of shooting, so once the boat has amassed 6 hits it sinks. We counted the sea as impassable terrain past 10cm from the beach, deep water, however Artillery, War Machines and Chariots count the sea edge as impassable. Overall the game went well, however in hindsight we should have changed a few things. Firstly all the armies should have started at the same time, being the Undead and coming on last meant that I did not get to engage in combat for the entire game, I only just managed to get my Chariots to the Orc Village before we had to pack up. The beach landing caused a major problem for the Empire, and the second army should have been deployed onto the beach in entirety on the 2nd or 3rd turn, rather than by rowboats. Even with these problems, everyone enjoyed the game. One thing that has come from the experience is that the mentality of our club members has changed, having been set a goal, they have put a lot of effort into painting and basing their miniatures, and a few have surprised themselves by managing to do it in time. One has even said that in future he will not play any game until he has painted his army. We hope that we can put on another display at Games Day 2001, we will have to wait and see.